Enjoy Lake Superior and Wild Goose Beach in this recently renovated cottage. Featuring two bedrooms (plus a spacious bunkie, with a queen sized bed) kitchen, washroom, BBQ and gorgeous unobstructed view of the Sleeping Giant. This camp is a Non-Smoking property. A cleaning fee will be charged if occupants smoke. The camp is also part of a Cottage Association. Quiet time is required between 11:00 p.m. and 8:00 a.m. It is a family environment and the owners are in the cottage next door. Non-compliance of noise, profanity rules will not be permitted. If you are looking for a great, fun place for a family; this is your place! Our family has enjoyed summers at Wild Goose Bay for over 10 years. We are now renting the cottage beside ours and are excited to share a great location with like minded travellers and families. This cottage is beside the public beach which is a great place for families. It also allows you to relax around the campfire while listening to the waves from Lake Superior. The kitchen has a fridge, stove/oven, sink, coffee maker, toaster and counter space. Dishes, coffee mugs, glasses and cutlery are all provided. There is a side and front lawn that is perfect for playing bocce, or other activites. We have two small kayaks available to use while you're here. Lifejackets must be worn, and parent supervision is required for children under 18. There is a private patio just outside the camp that has a table and six chairs. Cozy little cottage with amazing view! Spent 3 nights and absolutely no complaints! The place was spotless and super cozy. The bed in main cabin was very comfortable. (Didn’t use the bunk beds or bunk house so unable to provide review on those.) The bedding and towels were fresh and soft, and plentiful! Lots of dishes and functional kitchen - we made amazing meals while there. We neglected to bring coffee and was so relieved to find some there to get us through our first morning. We replaced in case the next renter does the same ! Nice front deck with cozy padded chairs for morning coffee or afternoon cocktails. Amazing space to stare at the amazing view of Lake Superior. The yard was very private with green space on the one side. Great fire pit which we used, nice touch to provide the wood. Very comfortable chairs on the beach to chill out on. Loved being able to use the kayaks. Beach was great. Very well suited for couples and/or families. Mike was great to deal with, very responsive (and quick!) on any questions. Nice little welcome gift upon our arrival. Mike even stopped by to say hello. Hands down one of the best Home Away rental experiences I’ve had. Great location. All around amazing spot ! We loved our stay in Wild Goose Bay. The cottage is clean and cosy and the view is breathtaking. It is close to lots of attractions and there is a beach and kayaks available to explore Lake Superior. The owners are friendly and helpful. We would definitely stay again if we were in the area and recommend it to anyone. 1) The location is very good: it is very easy to find and quick to get to, located far enough from the city but close enough to run back in if you need anything. 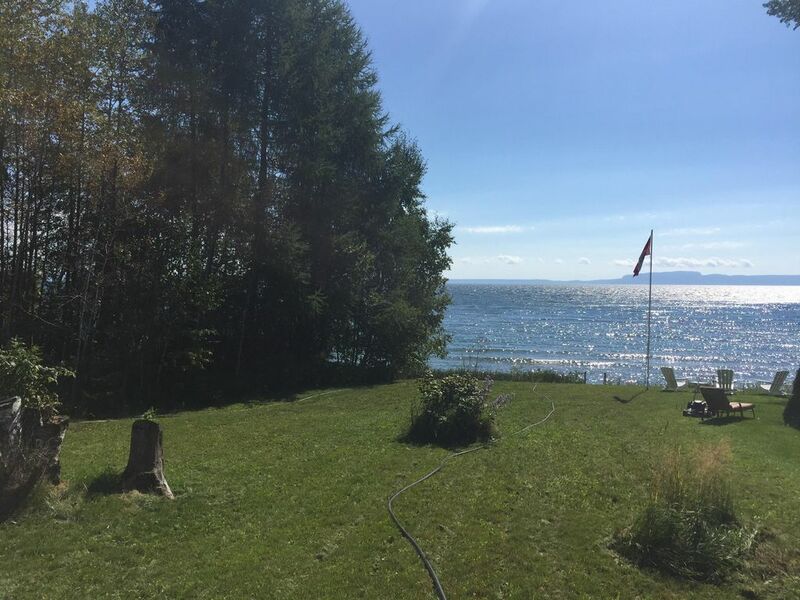 The camp is right on Lake Superior with easy beach access, and the decommissioned railway track is right behind the cottage for easy bike/running trail access. 2) The owners are really nice and accommodating: Mike and Julie were available to answer any questions we had and offer help if we needed it. They are exceptionally friendly and hospitable. 3) The camp itself was comfortable, clean, and well-appointed. It had more than we needed in the well-utensilled kitchen (coffee-maker, pots, pans, dishes, etc. ), activities for outdoors (canoe, fire-pit, etc. ), activities for nights/rainy weather (games, cable tv, books, videos, etc. ), and comfortable sleeping arrangements. Overall, it was very good value for the money, and we would definitely stay there again. Perfect setting - Great little lake cottage! Absolutely loved this cottage. It’s a great location: close to the city, but also far enough out of town that it’s quiet and peaceful. We used it as a base camp for hiking Slerping Giant park, and it was perfect for that. The cottage is very clean and well stocked with the essentials. The owners made us feel very welcomed with personal touches and they were easy to communicate with. We had a nice little fire, enjoyed the view from the beach chairs and thoroughly enjoyed our stay. We definitely would stay here again in the future! We didn't know what to expect when we planned on vacationing in the T-Bay area. I have to say it was an amazing experience and the location at camp 795 on Wild Goose Bay was perfect. The views of Naniboujou were incredible and the weather, minus the fire ban, was just right. The location in proximity to T-Bay was ideal (indeed, the Tomlin Restaurant is a world class eatery, and the walk around Prince Arthur Pier offers stunning views of the bay!). Camp 795 is also a great jumping off site for some incredible hikes in the area, especially in Sleeping Giant Provincial Park. The camp itself was perfect. It had all needed amenities and was extremely cozy for 3-adults. If it were warmer, we definitely would have gone canoeing and/or kayaking, since these are available to campers as part of the package. Kudos to Mike for making this a great time with so little effort! Thank you so much for your review! It was great having you as guests! The camp was very clean, and you communicated quickly.